Samantha was born and raised in Needham, Massachusetts, where she began her dance training. She continued her training at the Ailey School in New York City as a student in their pre-professional division, and went on to receive a BFA in Dance from Marymount Manhattan College with a concentration in Modern Dance. While at Marymount, Samantha had the opportunity to work with choreographers including Harriet Clark, Elena Comendador, and Pascal Rioult, under the direction of Katie Langan. Following graduation, she performed with New York City based company Arch Contemporary Ballet in venues across the country including the Ailey Citigroup Theater, Paramount Center Boston, Tempe Center for the Arts, and San Jose State University Theater. 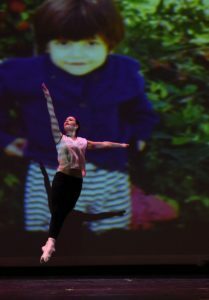 Samantha has also performed works by Trisha Brown as a part of the Dance/Draw Exhibit at the Institute of Contemporary Art Boston, and Jiwon Lee as a part of Freddie Moore’s Restoring the Dance at Alvin Ailey American Dance Theater. is also working as a company member with Karen Reedy Dance, and has performed with several companies in the DC area including DancEthos and DanceArtTheater. Samantha has been a Gin Dance Company member since 2015.